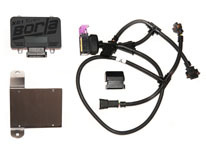 Borla’s plug & play XR-1® Tuner immediately adds up to 40 horsepower, 70lb/ft. torque, and improved fuel economy while cruising. » Simple DIY installation. » Quickly enabled and disabled. Plug in at the track, unplug for the street. » Stealth design leaves no trace in ECU flash memory. » Includes stainless steel mounting bracket, all cables and easy-to-follow instructions. » Not affected by dealer updates to the ECU. Tuner must be programmed before it is shipped. Notify Ola or Jason.